The food has been a highlight of our Balkan adventure. Here Mark is enjoying a few of the extremely inexpensive but delicious salads that accompany all of our meals. And that bottle of wine sticking out was great, too. 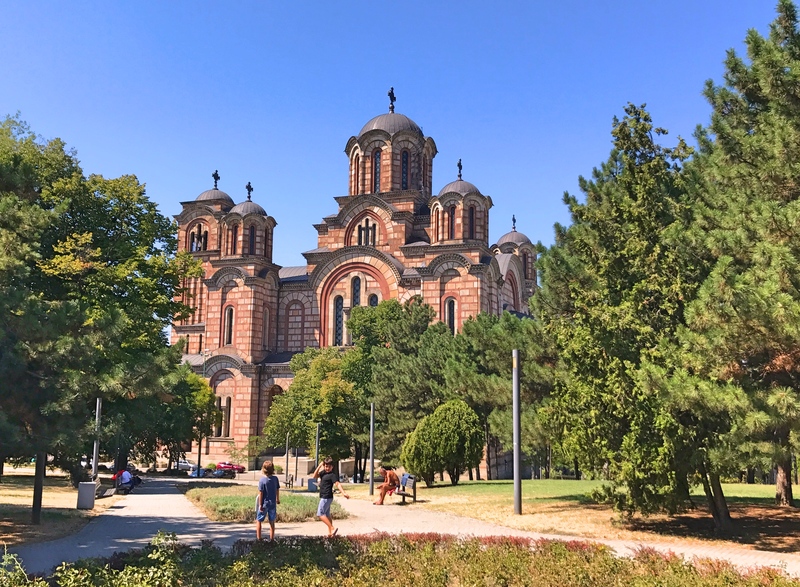 Our first stop on our Balkan road trip was the Serbian city of Niš (pronounced like “niche”), Serbia’s third largest city and the main city in the south. It was a brief stop and, to be honest, didn’t warrant more than that. There were some interesting parts to it, though. First, Niš is one of the oldest cities in the Balkans. As early as the second century AD it was important enough to warrant a mention in Ptolemy’s Geography. It’s big claim to fame, though, is that in about 272 a boy who would become Constantine the Great – the first Christian Emperor and founder of Constantinople – was born there. 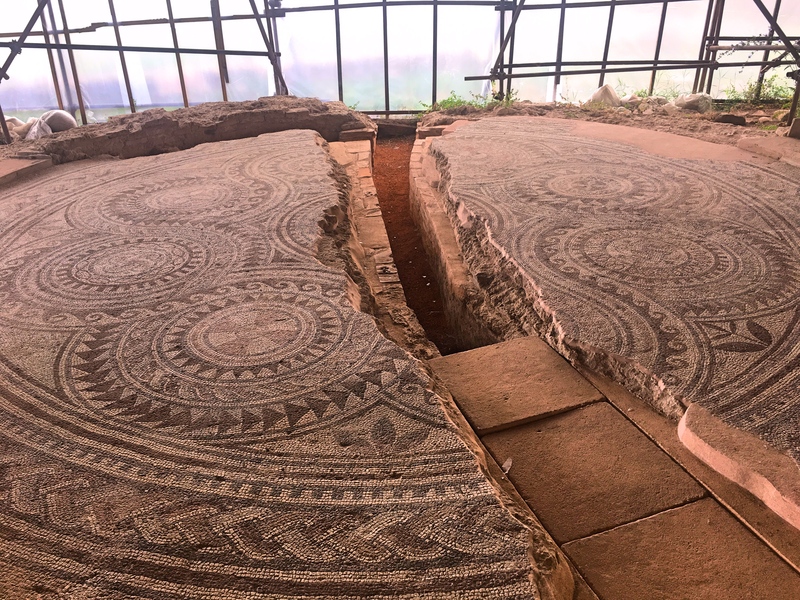 While emperor he built a palace in Niš, the remains of which are one of the sites to see in Niš though, as Mark puts it, they are the kind of ruins that give ruins a bad name. Here I am at the site of Constantine’s palace. Not a lot to see. 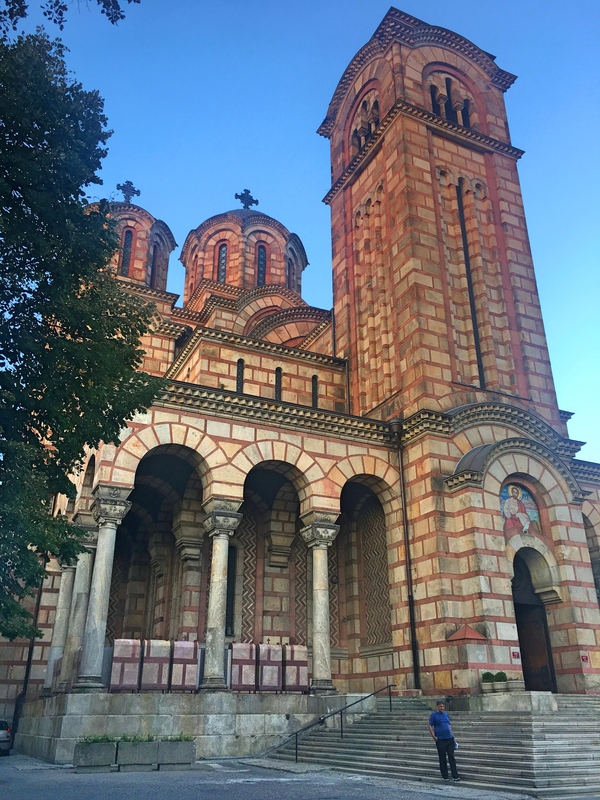 Later, adding to the city’s glory among historically minded Serbs, it served as the capital for Stefan Nemanja, the 12th century Grand Prince of Serbia and founder of the Nemanjić dynasty that evolved into the 14th century Serbian Empire. So yeah, there was a bit of history there. Then there was the Tower of Skulls, about as ghoulish as that sounds. Over the centuries Niš would go back and forth between Byzantine, Ottoman, and Serbian control. In the early 19th century Serbs were fighting to free themselves from Ottoman control; they were, sadly, losing that fight. With defeat imminent a leading Serb led a kamikaze mission to kill as many Turks as he could. He and his men all died, but they killed a lot more Turks in the process. 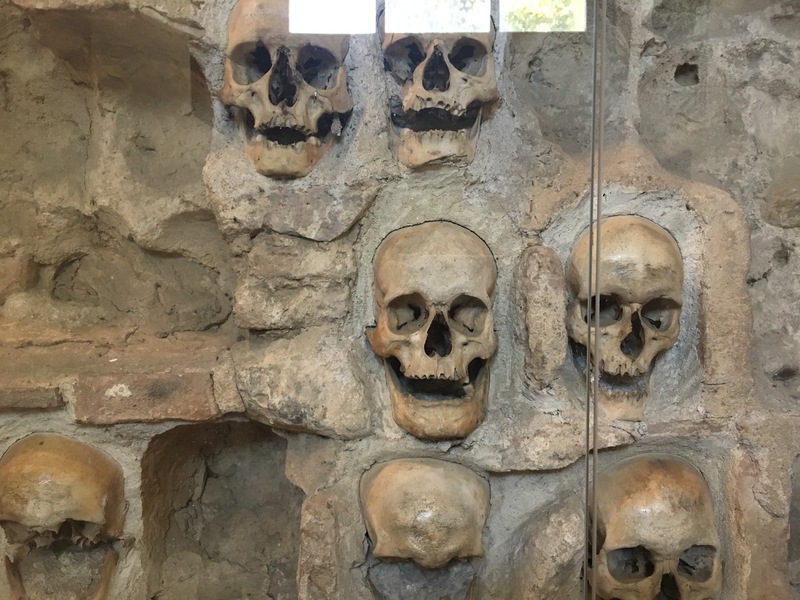 As a message to remaining Serbs the Ottoman leader had the dead soldiers beheaded, scalped, and skinned, then embedded their skulls in a tower. 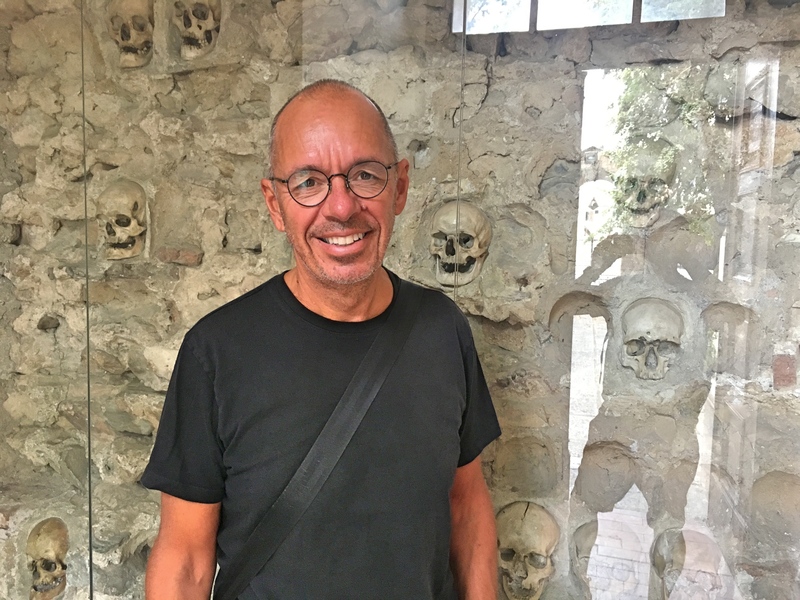 Of the original 952 skulls only 58 remain but interestingly it is seen today not as a warning against rebellion but as a tribute and proud monument to Serbian resistance. That was our two days in Niš. 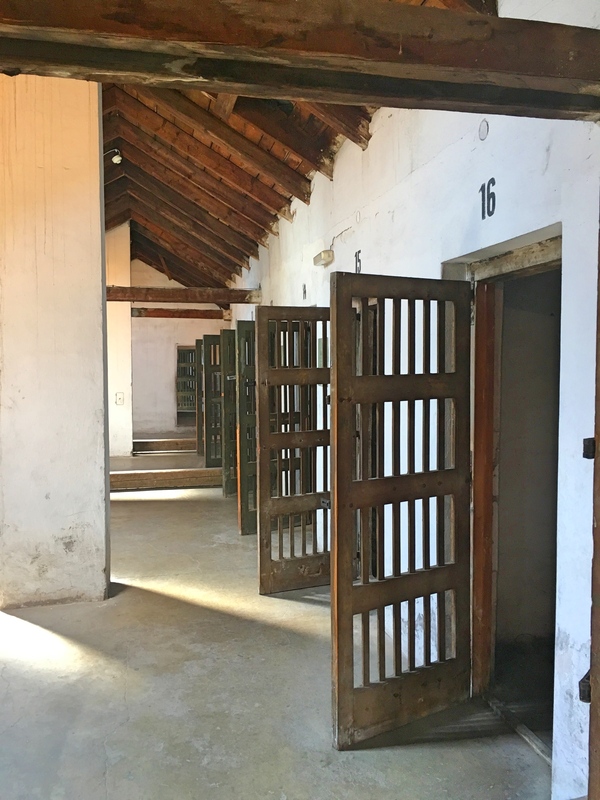 Along with the ancient ruins and the Tower of Skulls we toured a Jewish prison used during the holocaust, just in case we were too upbeat after the Tower of Skulls. There was a nice walk along the Nišava River and some good restaurants; we remain enthralled with the good and cheap food in the region. Two days were definitely enough, though, so from here we head further south into Macedonia. 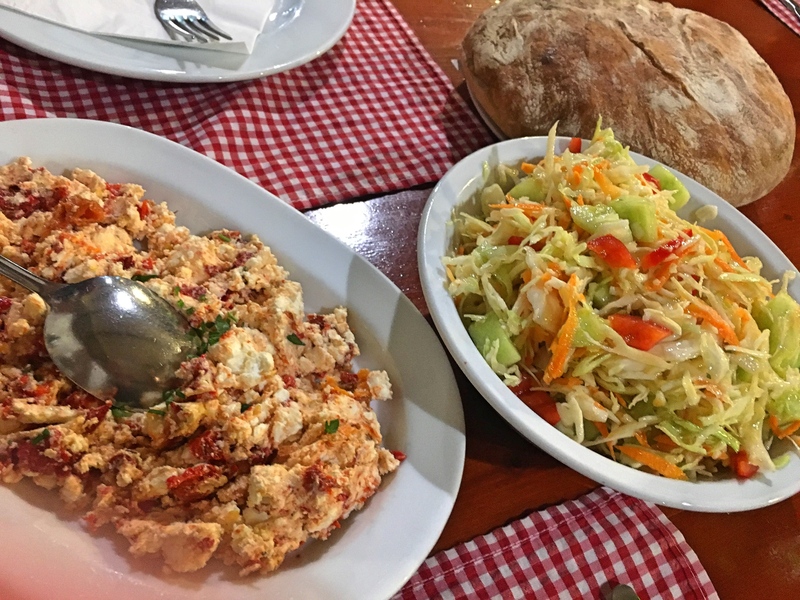 The cabbage salads are the best in the world and that dish that might look like scrambled eggs is really cheese with roasted peppers. Sadly, the bread gets ignored. 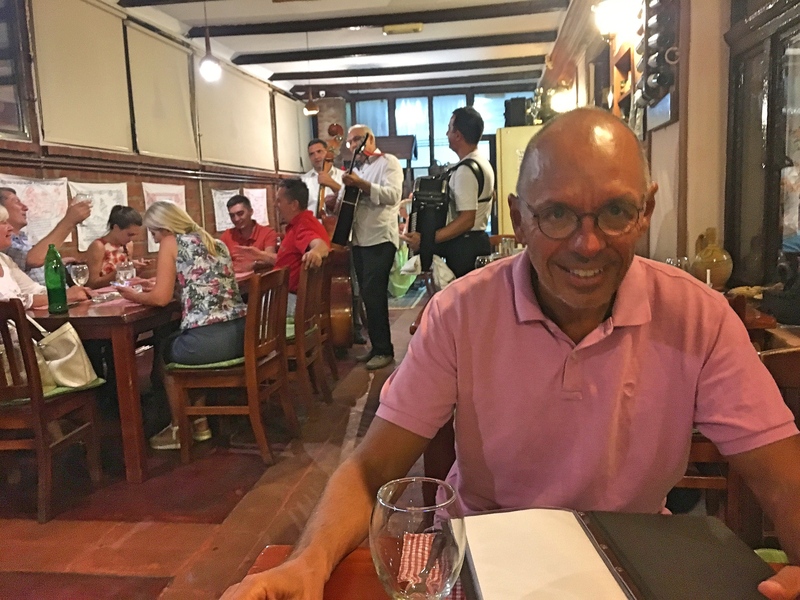 Dinner in a very local place with a very local group of musicians playing very loud music for very appreciative diners. We enjoyed it, too. Enjoying lunch at one of Belgrade’s many lovely sidewalk restaurants. The food is great and an unbelievable bargain at prices that are almost embarrassingly low. A funny thing about our arrival in Belgrade: for the first time in many months we really didn’t know where we were going next. Well back in 2016, you see, we were making plans for 2017 that included lots of time with friends along with visits to places in peak tourist season; think Japan during Cherry Blossom season or the Amalfi Coast in the middle of the summer. So we started booking places long in advance and soon had booked everything up to Dubrovnik. 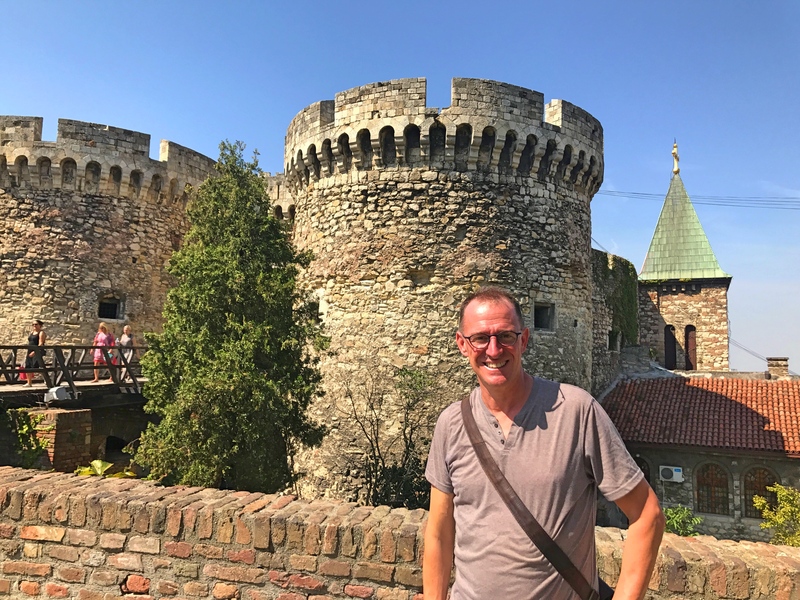 Then we added our plans through Bosnia with Marc & David and booked a flight to Belgrade. After that, though, we were uncommitted. 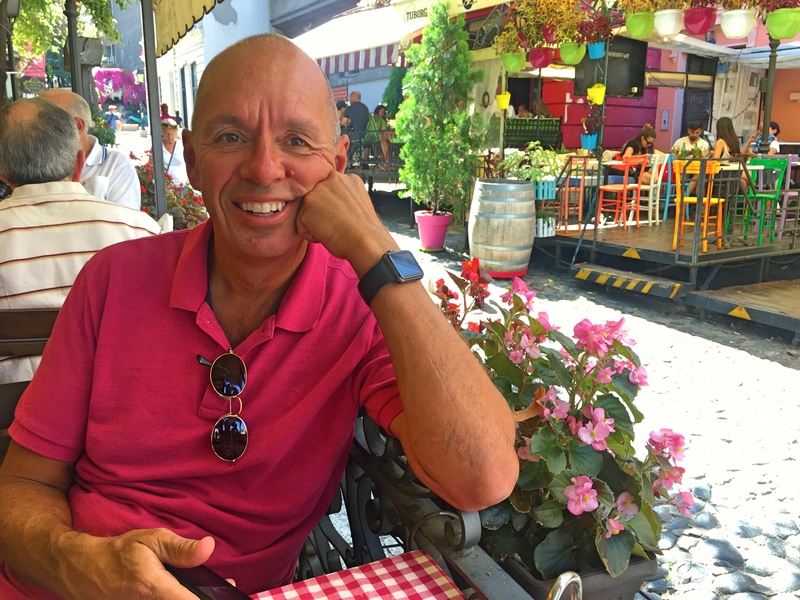 Thus our first item of business in Belgrade was to figure out the answer to the question “What’s next?” And the answer is that we’re going to do something very unlike Mark & Jim; we’re going to rent a car for a month and drive around the rest of the Balkans. We would normally take buses but the big problem is that we’re likely to be making a lot of relatively short stops and we would just be spending too much time on buses to make it work right. So – for the first time in our nearly 30 years together – we’re going to take a long road trip. We’ll see how that works for us. Now, back to Belgrade, the White City. Today the capital and largest city in Serbia, its history dates back to at least the 6th millennium BC. It was conquered by Rome during the reign of Augustus and subsequently changed hands repeatedly between the Byzantine Empire, the Bulgarian Empire, and the Hungarian Kingdom before it became the capital of an independent and powerful Kingdom of Serbia. That didn’t last, though, and it was captured by the Ottomans in 1521 after which it periodically changed hands between the Ottomans and the Austro-Hungarian Empire. Finally in 1918 with the demise of both the Ottomans and the Austro-Hungarian Empires, Serbia was named the capital of the Kingdom of Yugoslavia, later the Socialist Federal Republic of Yugoslavia, a position it was to retain until the breakup of Yugoslavia starting in 1991. During the years of Tito’s reign Belgrade was often a fashionable, elegant European capital. While his form of socialism was no more successful than that of the Soviet Union, the country still put on the best face for foreign celebrities. Our hotel – Metropole Palace – displayed glamorous photos of A-listers running the gamut from Sophia Loren to Che Guevara, Elizabeth Taylor to Haile Selassie, and Bridgette Bardot to Louis Armstrong staying there back in the day. It used to be quite the thing. 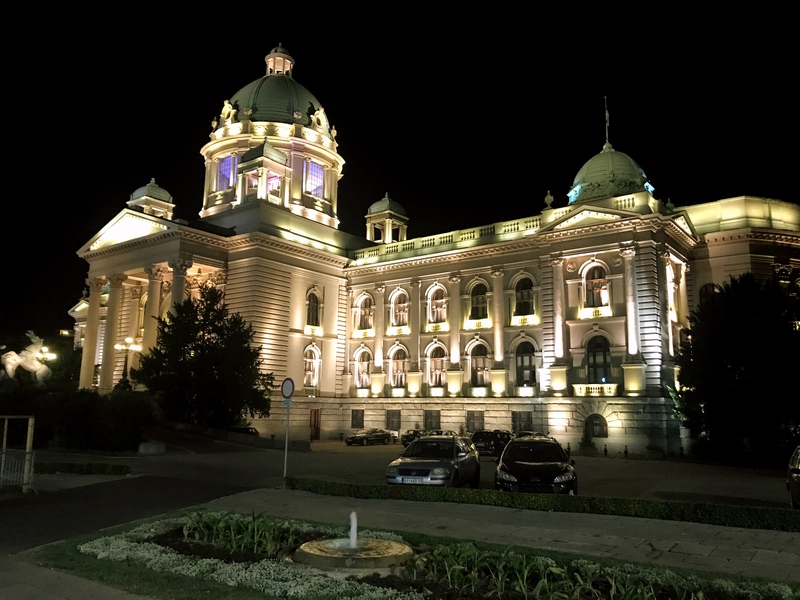 The National Assembly of Serbia at night. Not visible here are the pictures of Serbs killed by horrible, evil Kosovar Albanians. The Serbs, you see, hate pretty much everybody, though our experience is that Albanians are actually pretty nice. Today? Not so much. I’d hoped to be enchanted with the city but it was a hard place to fall in love with. Part of it, for me at least, is the history of war criminals running the place as recently as the 1990s. Beyond that, though, the city was subjected first to the ugly architectural experience of 20th century communism and then the NATO bombings of 1999. For the next several years Belgrade and Serbia as a whole suffered economically as then-President Milosevic and other high-ranking Serbs were indicted for war crimes making the country as a whole something of an international pariah. To this day one can see anti-NATO graffiti around Belgrade, though I didn’t sense any particular anti-American sense. 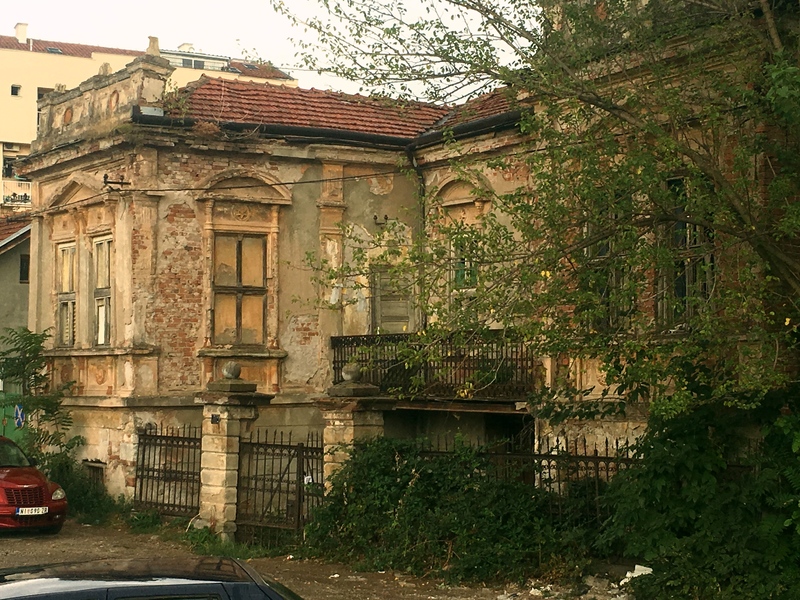 Today, then, war recovery seems further behind in Belgrade than it did in Dubrovnik, Mostar, or Sarajevo. It was only on our third day there that we were walking through an attractive pedestrian area in the city center when Mark observed that it was the first time he didn’t think the city was just ugly. They’re trying, though. 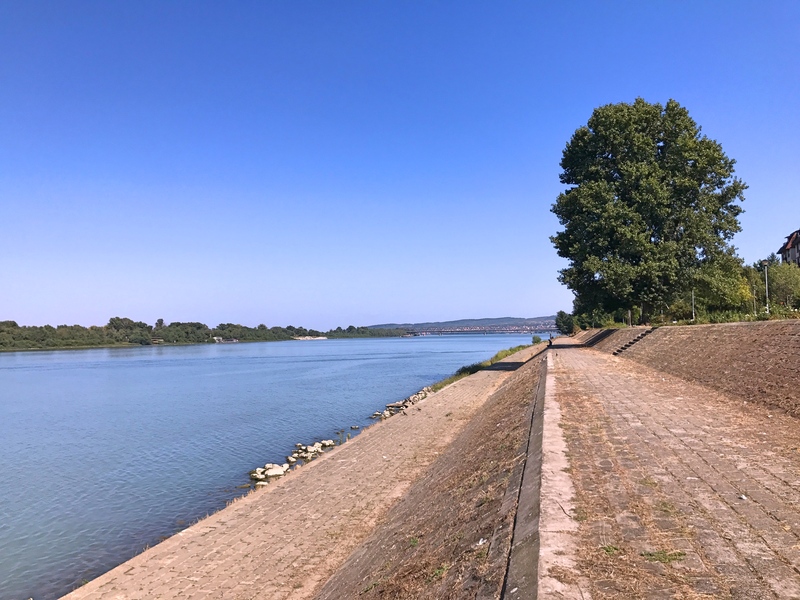 On one afternoon I went for a long walk along the Sava River and encountered what appeared to be an absolutely massive development project. I was right; the Belgrade Waterfront, started in 2014, is a controversial $3 billion project jointly funded by the Serbian government and investors from the Arab Emirates. The controversy, it seems, is the investment of such massive government funds to build luxury residences and five-star hotels with limited transparency or public input. The beautiful blue Danube is all but ignored by Belgrade. I enjoyed walking along it and then stopping to read at some length but apparently no one else realizes such a great river is right there. And speaking of the Sava River, on which the project is being built, one of the strange things about Belgrade is that while it is built at the confluence of the Sava and the Danube, the city takes essentially no advantage of the Danube at all. I walked down there the first afternoon we were in Belgrade expecting to see major waterfront development and found essentially nothing, just a run-down walkway and low- or at best moderate-income apartment buildings. What river development there is in Belgrade is along the Sava. I’m sure there are historic reasons for it but as someone who loves river walkways it sure seems like a lost opportunity. Ultimately there wasn’t a lot to see in Belgrade. 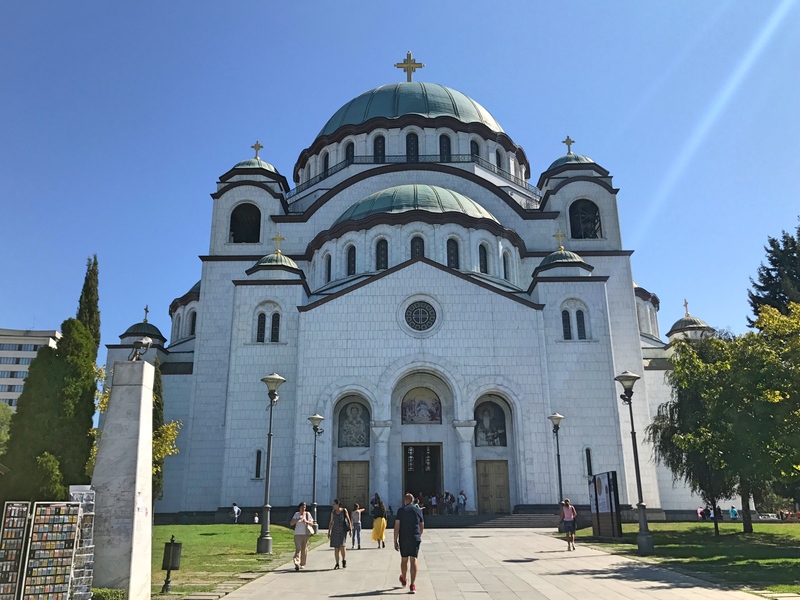 There were a couple of nice churches – St. Mark’s was near our hotel while the Church of St. Sava was a bit further afield. 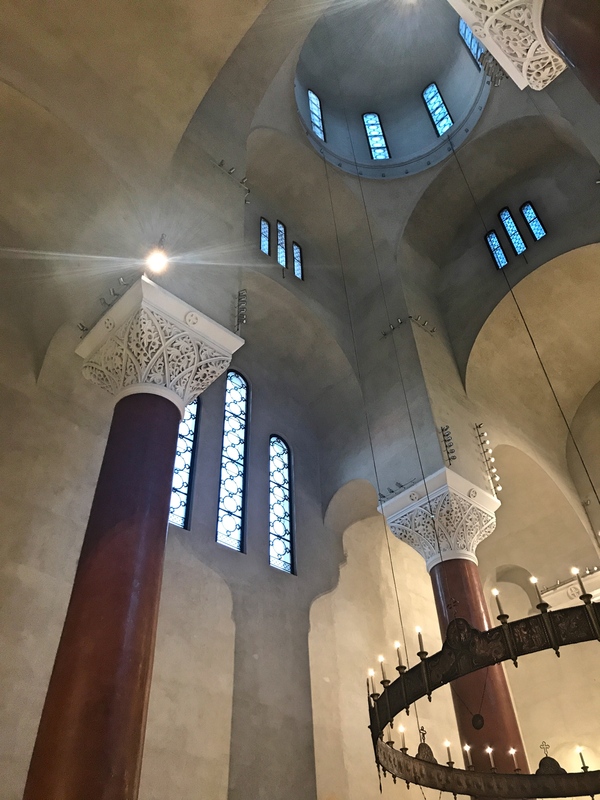 St. Mark’s dates only from the early 20th century and while the exterior is beautiful the interior is largely unfinished. I had assumed that perhaps it had been damaged during the NATO bombings and that they were just now repair it but it appears as though the interior was just never finished; WW II got in the way first, then there were those Communist years when they weren’t investing a lot in religion. St. Sava is even less finished, though perhaps more interesting. Dedicated to the founder of the Serbian Orthodox Church, it is built on the spot where his remains were burned by the Ottomans in 1595. If you’re Serbian, it seems, you never pass up a chance to remind people of how badly you’ve been treated by others and ultimately how evil those others are. 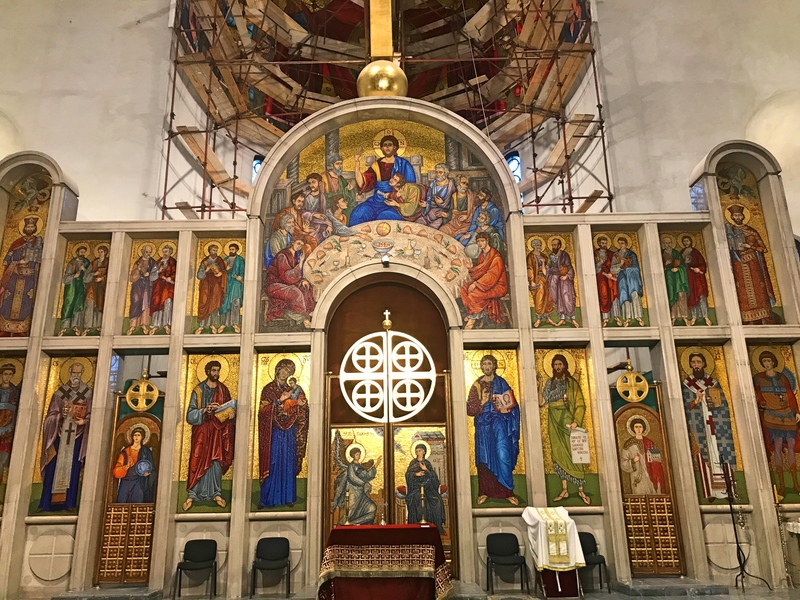 At any rate, the Serbs started talking about building a church there but these things take a while and they didn’t actually get started until 1935. They had started putting up the walls when the Germans invaded and then, again, the Communists came to power. Both the Nazis and the Communists used the very unfinished church as a parking lot; in later years it was used as a storage shed. As the walls deteriorated, local kids allegedly believed they were playing in the ruins of an old castle. 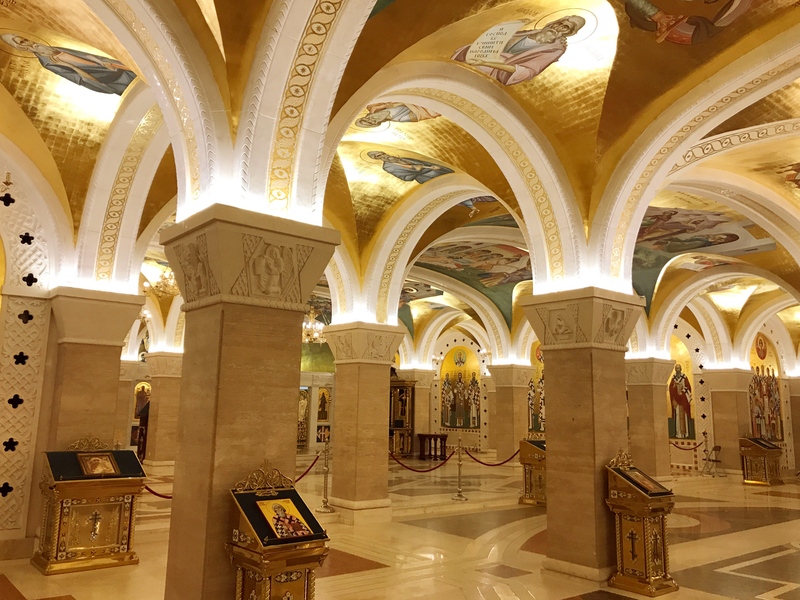 Finally in the 1980s the Orthodox church got permission to restart the project and today – after another hiatus during and after the NATO bombing – the structure is completed. From the outside it looks like a normal church, though unusually large. 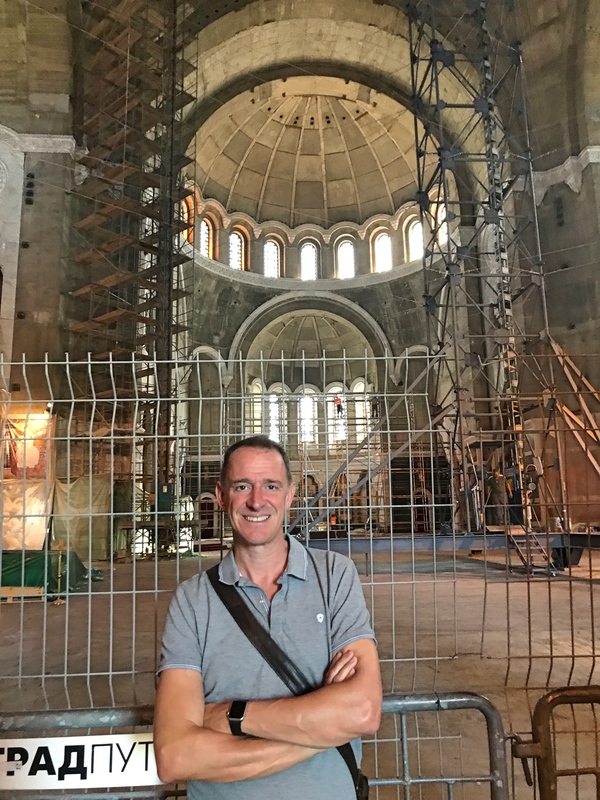 It is, you see, the largest Serbian Orthodox church and one of the biggest churches in the world. Inside, though, it is initially pretty underwhelming as it is almost completely unfinished. Until you go downstairs, that is, where they have indeed finished that area in stunning style. I think of great church-building as a thing of the past and find it pretty impressive that people are still able to dream such big dreams. We’ll have to come back in 10 or 15 years to see how much they’ve managed to finish. St. Sava Church is one of the largest churches in the world. The 4,000-ton central dome was built on the ground and, over forty days, lifted by custom-built hydraulic machines onto the walls. I’m impressed. As for the rest of Belgrade, there was a beautiful park near the hotel that I enjoyed and I – though apparently no one else in Belgrade – enjoyed sitting by the Danube in the afternoon reading. 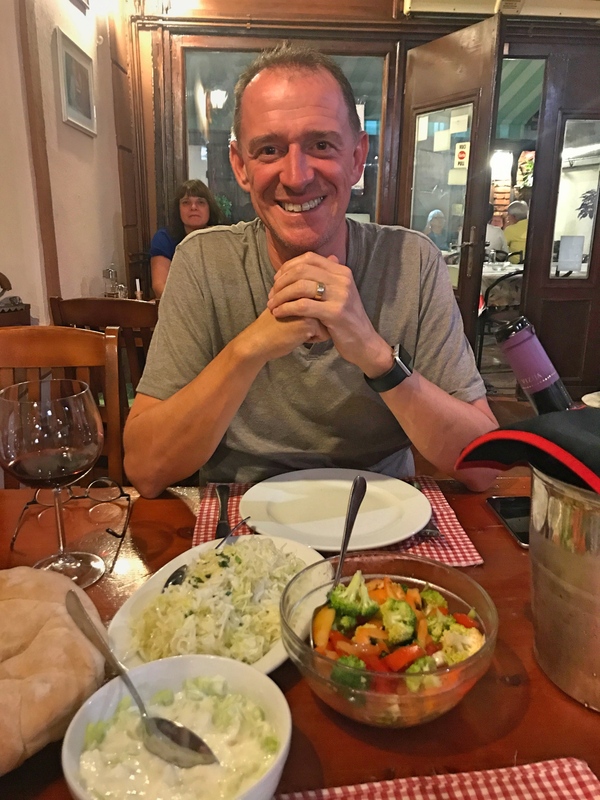 We’re loving the Balkan cuisine with wonderful local produce (especially the various tomato salads) and great grilled food. 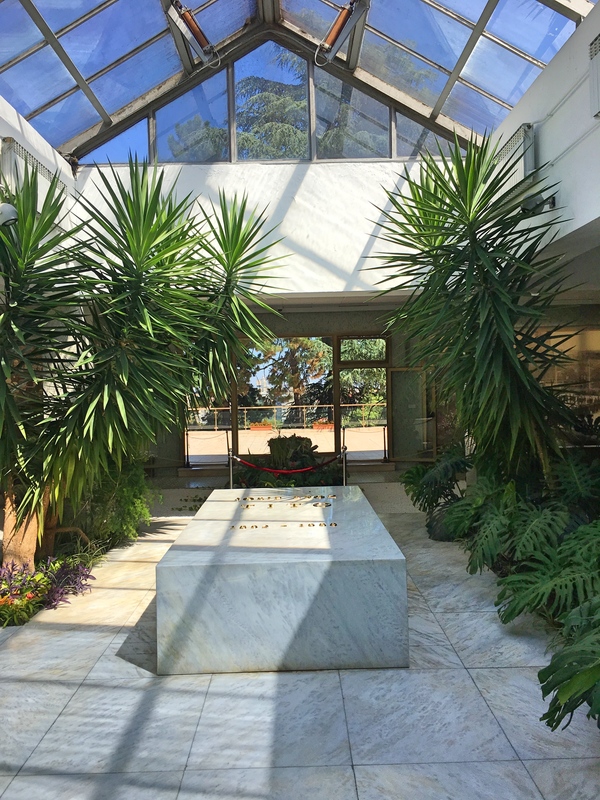 We managed to take in former Yugoslav dictator Tito’s mausoleum and were intrigued by the way he is still treated as a national hero here in Belgrade. Other museums, though, didn’t work so well. Both the National Museum of Serbia and the Museum of Contemporary Art are well-respected art museums and both are closed for renovation. From here, then, we get in a car and head south. 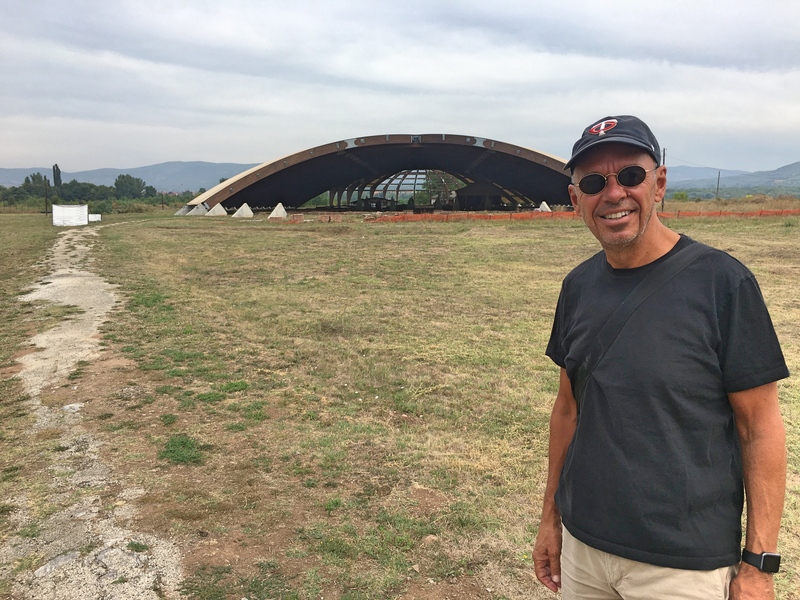 We’ll make one stop in southern Serbia before moving into Macedonia. From there the plan is to circle the Balkan peninsula counterclockwise into Greece, Bulgaria, and Romania over the next four weeks. That will add up to more time in a car than we’ve spent in many years. Who knows, maybe we’ll discover that we like cars, though to be honest that’s not likely. But most of it is not. It seems as though they have a long way to go…. 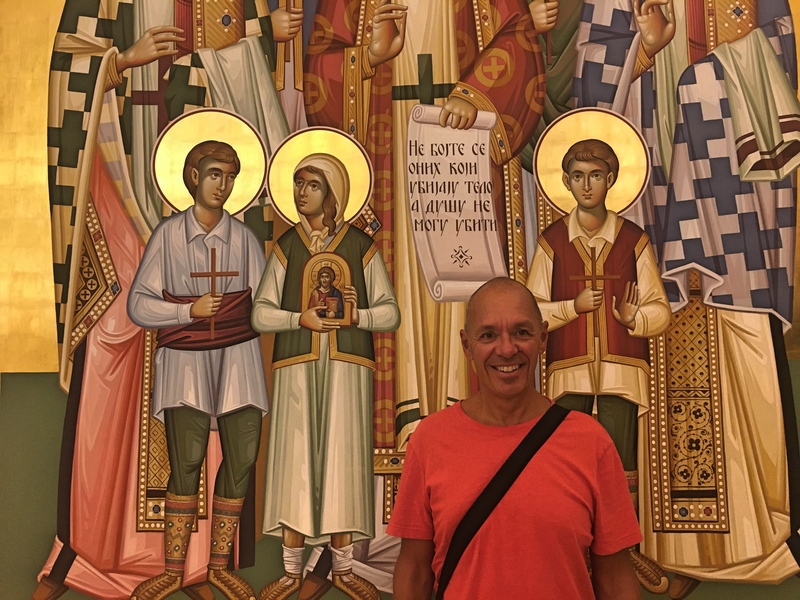 Here I am taking my place with the brilliantly colored saints in St. Sava. I think of this kind of religious art as typically being aged and worn but here it is vibrant almost beyond description. And then there was a Tito, a brutal dictator treated by Serbs as a hero though he was born to a Slovenian mother and Croatian father. Breaking from Stalin he became a leader of the non-aligned movement of the 1950s and 1960s. While he championed the anti-colonial movement he wasn’t so fond of independence for the various Yugoslav Republics and wasn’t so nice to their leaders. 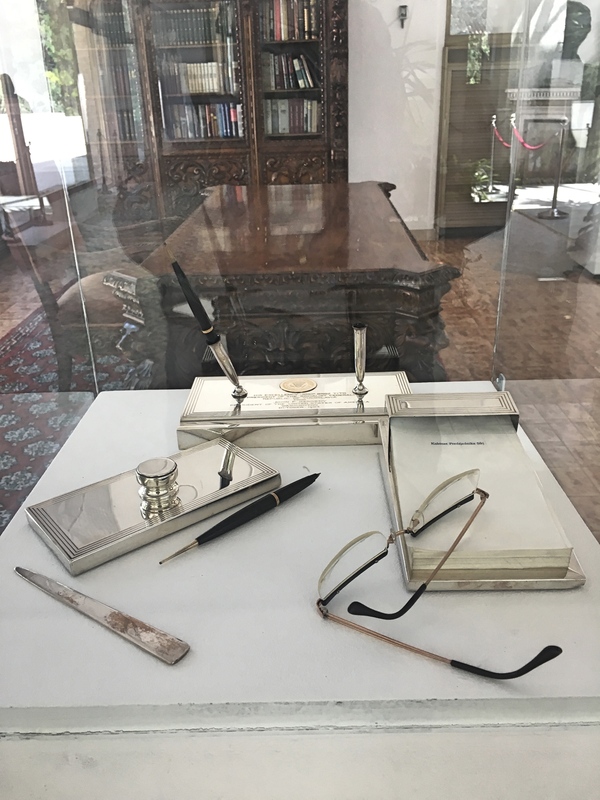 Included in the little museum dedicated to Tito was his desk, seen in the background, and this desk set inscribed to him from President Kennedy. Given his break from the Soviet Union the U.S. was overtly friendly with Tito, ignoring his many human rights abuses in the interest of poking a finger in the Soviet eyes. And finally, our visit to the Serbian dentist. Every six months we find someone to clean our teeth and it came due here in Belgrade. We were a bit intimidated by letting some Serb dentist into our mouths – the U.S. did, after all, lead a bombing campaign against Serbia less than 20 years ago – and this grim entrance didn’t inspire confidence. 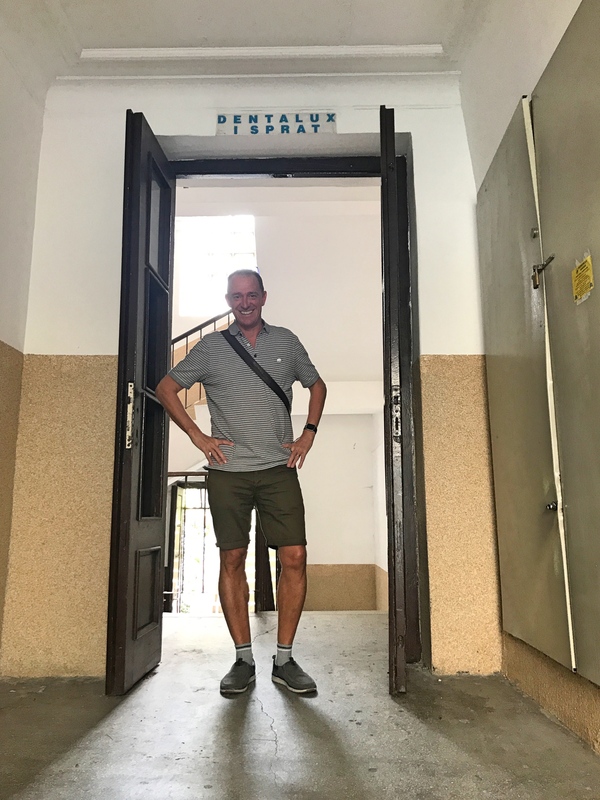 The experience was a bit odd – he used some chalky stain remover that felt like a throw-back to the Communist era – but otherwise it was uneventful.